The Keysight E4980A is available to buy refurbished used or rent, usually from our UK stock. Click here to download the Keysight E4980A datasheet. The E4980A precision LCR meter provides the best combination of accuracy, speed, and versatility for a wide range of component measurements. Offering fast measurement speed and outstanding performance at both low and high impedance ranges, the E4980A is the ultimate tool for general R+D and manufacturing test of components and materials. LAN, USB and GPIB PC connectivity enhances your design and test productivity. We offer the refurbished used Keysight (Agilent) E4980A Precision LCR Meter 20Hz-2MHz for sale and rental. The Keysight E4980A is fully tested and refurbished in our in-house ISO9001 calibration laboratory. We supply manuals, accessories, full warranty and a free-of-charge Certificate of Conformity. 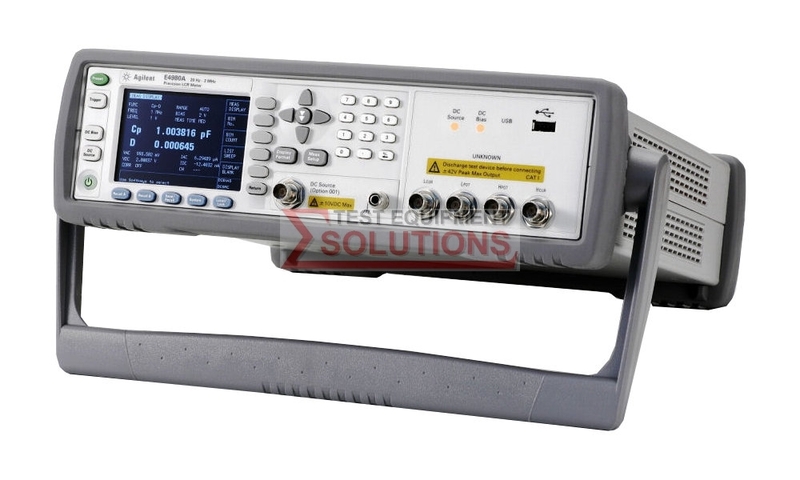 We can also provide the Keysight E4980A with a fresh calibration for a small additional charge. If you have under-utilised test equipment talk to us about trading-in or part-exchanging it towards the Keysight E4980A or other refurbished test equipment. E4980A - 005 - ECONOMY OPTION WITH LESS MEASUREMENT SPEED. SAME MEASUREMENT ACCURACY AS THE STANDARD MODEL.